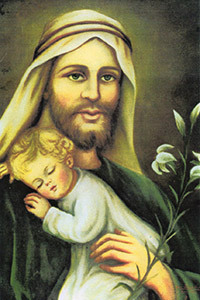 O Glorious St. Joseph, faithful follower of Jesus Christ, to you do we raise our hearts and hands to implore your powerful intercession in obtaining from the benign Heart of Jesus all the help and graces necessary for our temporal and spiritual welfare, particularly for the grace of a happy death, and the special favor we now implore. O Guardian of the Word Incarnate, we feel animated with confidence that your prayers on our behalf will be graciously heard before the throne of God. O Glorious St. Joseph, spouse of the Immaculate Virgin, obtain for me a pure, humble and charitable mind, and a perfect resignation to the will of God. 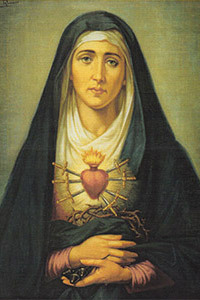 Be my guide, father and model through life, that I may merit to die as you did in the arms of Jesus and Mary. My Lord and my God, Thou has promised that "anything we ask the Father in Thy Name He will give." Relying on this promise we now ask our Heavenly father for these, our needs. We ask for them in Thy Name, O Jesus, provided they be for our good and Thy greater glory. (Mention favors). 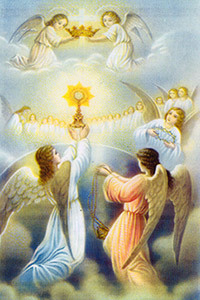 Eucharistic Heart of Jesus, I firmly believe Thou canst grant me this favor that I ask, even though it should demand a miracle. For Thou hast only to will it and my prayer is granted. Filled with this confidence, O Jesus, I come to Thee in the Sacrament of Thy love. Despise not my petitions but in Thy goodness hear and answer them. Show to all that Thou hast the Heart of the best of fathers and that He Who has given Thee to us for our salvation will through Thee and in Thy Name receive and grant our prayers. Amen.